After commenting on a friend’s wall post on Facebook where he asked asking whether this Gospel Coalition post or the topic of grace struck a chord in my experience I was left to ponder the word “grace” and explore what meaning it can reflect on an eternally stagnate source of morality and being. 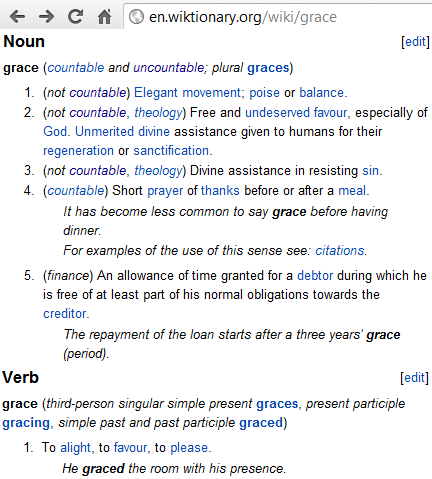 The over all meaning of grace seems to be a perception of an unexpected redemption of dignity by some measure. Someone stepping on a skate only to roll along and keep walking. A leader granting amnesty. An ex-friend’s concern for your well-being. Doubly graceful is a school bully nearly slipping on a kid’s skateboard only to take it in stride handing the skateboard back without issue. Anyone who knows anything about Christianity knows that Jesus’ version of God forgives any who approaches and repents in earnest regardless of previous transgression. Propping up the perception of grace here is the concept that you, me, and rest of humanity doesn’t deserve a fraction of the clemency being offered by this deal. Quite the opposite, God is fully justified to judge every one of us to eternal pain and/or oblivion. Deserving absolute loss but being granted fully dignity; if grace has an ideal this would be it. Wouldn’t it? Commodus: [to Falco (his second)] Lucius (the son) will stay with me now. And if his mother so much as looks at me in a manner that displeases me, he will die. If she decides to be noble and takes her own life, he will die. Commodus: AM I NOT MERCIFUL?! Is it a fair comparison? I think this is as fair a comparison as any. Normally I try to keep a welcoming table for any detractors, but I don’t see any other way to roll this topic out. How graceful would the parable of the prodigal son sound if the father had a torture room awaiting the son if he didn’t worship the father upon return. Replace the son with everyone, the father with God, and the return with all death ever. Grace? That rings more like extortion and self-deprecation in my ears. What am I missing here Christians? I think that the reason you are coming to the conclusion that you do is that in your attempt to understand grace you are, for the sake of argument, accepting the assumption that hell exists and that Jesus is God but not accepting other implications of Jesus’ divinity. In other words, you’re looking at mankind and God from a perspective of atheism and it is affecting your understanding of grace. When you say “How graceful would the parable of the prodigal son sound if the father had a torture room awaiting the son if he didn’t worship the father upon return.” This is where you’ve inserted your atheistic view of man and God. If I understand you, in your view, there is no way that people deserve to go to hell, and therefore for Jesus to “pay” for something they don’t really owe doesn’t make any sense and is no more than an attempt to intimidate and extort worship from people on a basis that He will unjustly punish them if they don’t do what He wants. The view that there really is a hell and Jesus offers a way out of it comes from the Bible. How many people do you know of who believe that, but don’t believe in the Bible? I don’t know any. My point is, if you believe the Bible on matters of hell, then you will also accept that people deserve to go there, and for that matter that God is good, even if you can’t understand it all. I think the important thing to understand from the Christian viewpoint is that we believe that God knows everything and desires the good of everyone. Given that assumption, it makes sense to trust Him about hell and it does not make sense to think that He is trying to manipulate people. What would the omniscient, omnipotent creator of the universe care about the praise of far inferior beings. He knows He’s awesome. The only reason He would be interested in our praise is if He loves us. From your perspective as an atheist though, not only do you not believe that people deserve to go to hell, you don’t believe in hell, or God. So I don’t know how much sense it makes to have an opinion about the grace of God being a sham if you’re only assuming that hell exists, and Jesus provides a way out, but not that people deserve to go to hell, all ideas which are contained in the Bible. Nevertheless, it is common for anti-Christian atheists to hold a view that God is a tyrant (even though they don’t believe in God) which I think is unfair – or at least, doesn’t make any sense since they don’t really believe in God. I think that is actually the point of the article you linked to. The author assumes an atheist’s view of the God of the Bible is that He is cruel and selfish and therefore his view of the grace of God will be totally unlike a Christian’s view of the grace of God. You’re right, I don’t believe that people deserve to be punished eternally for simply being born human. And you are also right that this is why I think the Christian claim to God’s grace is a false one.